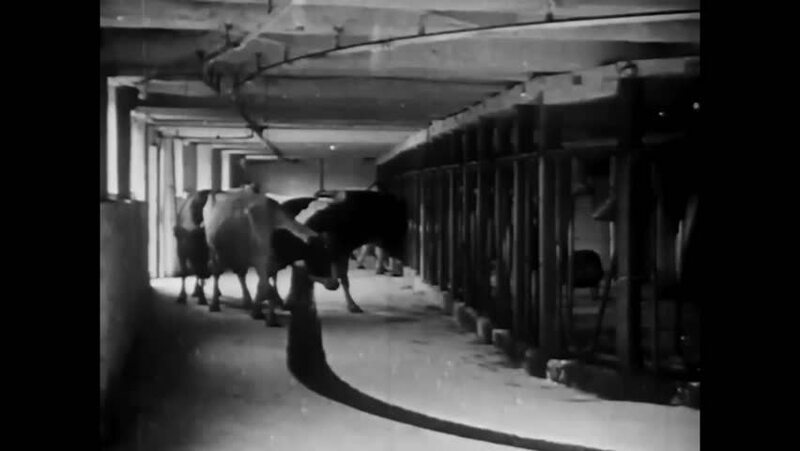 CIRCA 1920 - Cows are milked and wander around a new dairy barn. 4k00:251940s: Boy chews, shore in background. Two boys ride donkeys on the street with chickens piled on the donkeys. Boy walks along the ocean and smiles, sand beach and palm trees in background. 4k00:07TRYON, NC 1941: Mother arrives at railroad train station holding daughters hands. hd00:30FOUNTAIN GREEN, SANPETE, UTAH 31 JUL 2012: Flood damage walls in home basement. Water mud debris pump and shovel removal. Wildfire burned vegetation rain caused surge of muddy ash water filled home. hd00:26DUBROVO, RUSSIA, APRIL 23, 2016: Man walking in old abandoned building looking for an artifact of the quest game. hd00:46CIRCA 1950s - A camel caravan and a bazaar and a sheik in a government meeting and an Arabic families and Jews are shown in the Middle East.